Blackwood Seven says its platform improves media performance and helps clients insource. When the three founders of Blackwood Seven set up their artificial intelligence media agency in Denmark in 2013, they didn’t pick the name just because it sounded enigmatic with military overtones. They wanted a short name that would work online and wasn’t already taken. But Blackwood Seven, which has just opened a UK office, has provoked fear across the big media agency networks because its algorithm-based predictive technology threatens to challenge their business model. The Copenhagen shop already claims to manage €400m (£360m) of billings a year for brands such as Volkswagen, Amazon, Groupon and Dollar Shave Club, and it has 200 staff in offices including Germany and the US. "So far, it’s been a sprint – we’ve been running fast," Carl Erik Kjærsgaard, Blackwood Seven’s chief executive, says on a visit to London with another founder, Henrik Busch, who is moving to the capital to be its UK chief executive. Blackwood Seven’s software platform works by using 82 data sources – from YouGov and Nielsen to a client’s sales information and the weather – to predict the likely outcome of the media plan and allows a campaign to be optimised in real time. Clients can get a "25%-50%" improvement in the effect of their media by using the technology, Busch says, adding it is "mind-boggling" that many brands still rely on agencies to manage their media spend "manually" and "are navigating it on gut feeling". The fact that marketers can buy media themselves – not only digital and social but also TV, outdoor and print – through the platform suits an era when brands are looking to bring more of their marketing in-house and outsource less to agencies, according to Kjærsgaard. Blackwood Seven sells its software as a service, known as a SaaS model, for a monthly fee. That contrasts with a traditional agency, which might charge clients a percentage of billings and commit to investing a certain share or volume of adspend with particular media owners to get a discount. SaaS appeals to advertisers because trust in agencies has declined, Kjærsgaard suggests, pointing to the Association of National Advertisers’ scathing report in the US. "I’m not bragging, but when we come in to see some clients with the offering we have, we find people who want to change the ecosystem and they really embrace us," Kjærsgaard claims. "We only have one service – we aren’t trying to sell you the production of an ad, an events business and so on," Busch adds. "The clients really trust us. We only have one agenda: to optimise their media investments. We are very much in favour of clients insourcing their digital and Facebook." Marketers are surprised, according to Busch: "They smile and say they’ve never met an agency before who hasn’t said ‘We can do it cheaper’ and tried to grab the business." Kjærsgaard predicts that AI and in-housing could force traditional agencies to get rid of a third to a half of their staff. "All the hot hands administering the Excel spreadsheets over a two-week period to make a media plan will be gone," he says. The networks also face "tremendous pressure" from software giants such as SAP (which has signed a deal with Blackwood Seven), IBM, Oracle, Adobe and Salesforce because they want to work directly with brands on datadriven marketing, Kjærsgaard argues. If Blackwood Seven’s founders come across as "network killers", it’s because they all used to work at them. Kjærsgaard was chief executive of Grey in the Nordics, Busch worked for IPG Mediabrands and Thomas Bertelsen, who runs the German office, used to be chief executive of OMD in Denmark. "We’ve never been Maths Men," Kjærsgaard says, explaining how the founders have recruited a lot of people with a physics background since they are "very good at calculating stuff". Half the staff work in AI and building the tech platform. It is "difficult to recruit" the right people so the agency set up a team in Barcelona because it is a magnet for international talent. "The women are nice and the food is good," he says in a surprising admission, before hastening to add the tech team isn’t just made up of blokes. The UK media industry is "much tougher" to crack than the US, Kjærsgaard says: "There are too many people who know each other well in this city." 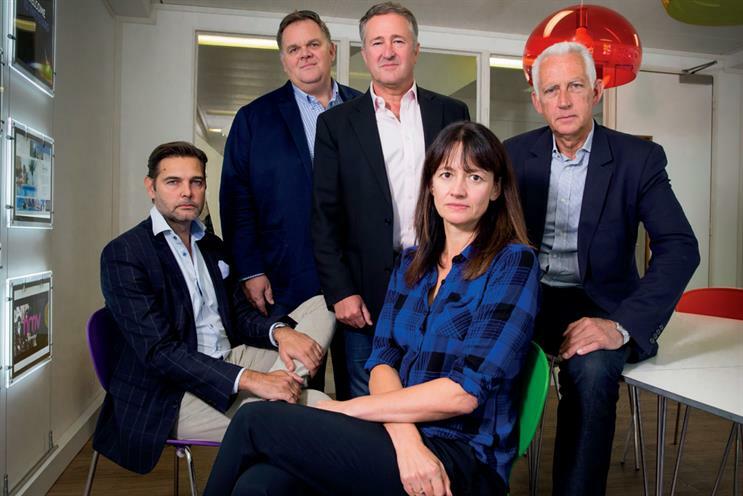 So the agency has recruited three Britons as non-executive directors of the UK office: Jenny Biggam, co-founder of the7stars; Nick Fox, founding partner at Atomic London; and Bob Wootton, former director of advertising and media at ISBA. It has also agreed a partnership with Biggam’s independent agency, which has a similar ethos because it buys media on a transparent, client-by-client basis rather than doing group deals to get rebates. The UK media industry is "much tougher" to crack than the US, Kjærsgaard says: "There are too many people who know each other well in this city." Blackwood Seven is sharing office space with Bountiful Cow, the media start-up that the7stars has just launched, in Chancery Lane. It is thought the agency also sounded out Goodstuff Communications to be a partner but got cold feet because Omnicom has a minority stake. The question is whether Blackwood Seven’s technology is game-changing and how easily it can be duplicated. Wootton says it "allows the client to have transparency" and Biggam believes it can help to undermine the "secretive" nature of media trading. However, German independent Mediaplus has developed an AI product and is said to be competing hard. The networks are also working on AI and automated trading models. Kjærsgaard claims it’s a case of "old wine in new bottles", declaring: "We have built the platform. Do you have the platform? No." Jenny Bullis, EMEA chief executive of Essence, the digital shop bought by WPP last year, believes Blackwood Seven has found a gap in a similar way that Essence did. A growing number of brands, particularly the new wave of ecommerce and techfocused companies, "want to control and execute media themselves". "They have a self-reliance where they run all digital and even creative in-house. These type of companies display a frustration with the older model of traditional agencies, so new ways of working are welcomed," she says. "Blackwood Seven clearly looked at media planning and buying and saw a more efficient and contemporary way of doing it, wrapped up with inherent transparency." Blackwood Seven’s expansion has been backed by its venture-capital investors. "We have a global ambition," Kjærsgaard says, explaining how he measures success by number of clients, not billings, as he expects more brands will insource their media spend. He warns: "The current way media is traded can’t go on."